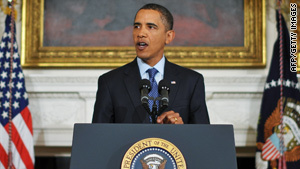 A recent poll suggests Barack Obama's rise to the presidency has resulted in a surge of optimism for African-Americans. Fifty-four percent of African-Americans says Obama has improved race relations in U.S.
(CNN) -- A year after the election of America's first African-American president, blacks in the United States are expressing optimism about racial progress not seen in a quarter-century, according to a new report by the Pew Research Center. Thirty-nine percent of African-Americans said the "situation of black people in this country" is better than it was five years ago, nearly twice the 20 percent who said the same in 2007. The optimism is not limited to the present, but covers the future as well. A majority of African-Americans polled, 53 percent, said that life for blacks in the future will be better than it is now. Two years ago, the number was 44 percent. The historic election of Barack Obama to the White House appears to have played a role in the positive sentiment. Fifty-four percent of African-Americans said they think Obama's barrier-breaking election has improved race relations in America. One-third of whites polled agreed, while 45 percent said his election has made no difference in race relations. Personal finances have improved for blacks, according to the report. One-third of African-Americans polled rated their financial situation as excellent or good. In 2006, the number was 27 percent. During the same time frame, economic fortunes for whites slumped, dropping from 52 percent then to 35 percent now. Even with the upbeat findings, more than eight in 10 African-Americans said the country needs to make more changes before blacks have equal rights with whites. About one-third of whites agreed. The phone survey of 2,884 adults was conducted October 28 - November 30, 2009, and has a margin of error of plus or minus 3.0 percentage points for the full sample. Error rates vary among sub-groups within the survey.